The Half-Earth Project has launched online the first phase of their cutting-edge global biodiversity map. 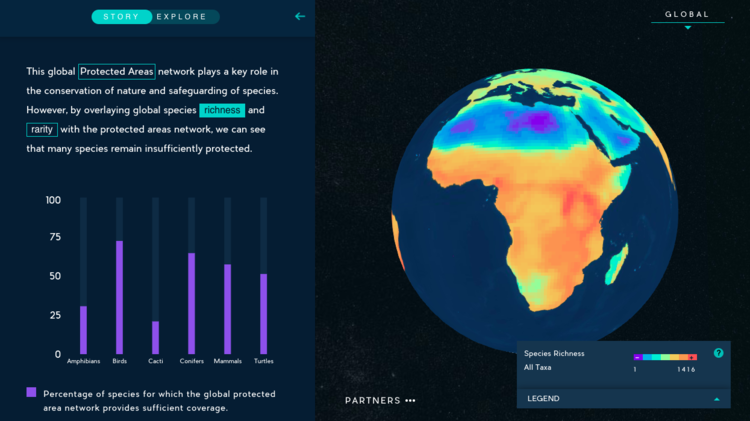 This unique, interactive asset uses the latest science and technology to map thousands of species around the world and illuminate where future conservation efforts should be located to best care for our planet and ourselves. Born from Wilson’s book Half-Earth: Our Planet’s Fight for Life, the Half-Earth Project is providing the urgently needed research, leadership and knowledge necessary to conserve half the planet’s surface. The new map sits at the center of this effort. The Half-Earth Project is targeting completion of the fine-scale species distribution map for most known terrestrial, marine, and freshwater plant and animal species within 5 years. A $5 million leadership gift from E.O. Wilson Biodiversity Foundation board member Jeff Ubben and his wife Laurie will seed the second phase of the Half-Earth Project’s mapping effort. Join the effort to protect half the Earth for all of life.